Chiron Health is an entirely cloud-based service. No software to download and every client is always on the latest version. Seamlessly integrate with existing practice workflows by scheduling video visits directly in athenaNet. Once selected, all details are synced to Chiron Health automatically. No duplicate work is ever required. Chiron Health simplifies the appointment process for your patients and staff. As soon as a video visit appointment is scheduled, patient insurance information is auto-synced. No repetitive paperwork is needed. Automate patient telemedicine eligibility checks with the Chiron Rules Engine. This robust database has a deep understanding of state mandates and payer specific claims. Leave the reimbursement details to us. 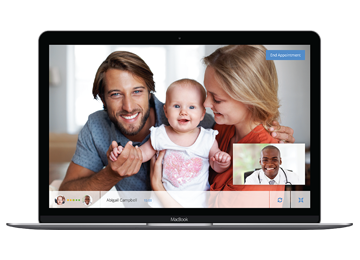 Chiron Health appointments are secure, HD video, and HIPAA-compliant. All documentation is completed in athenaNet, which means no new clinical systems to learn. athenahealth brought you the Meaningful Use guarantee. We bring you the Chiron Reimbursement Guarantee®. We guarantee full reimbursement from private payers for video visits (usually at the 99213 – 99214 level), or we’ll reimburse the claim ourselves.